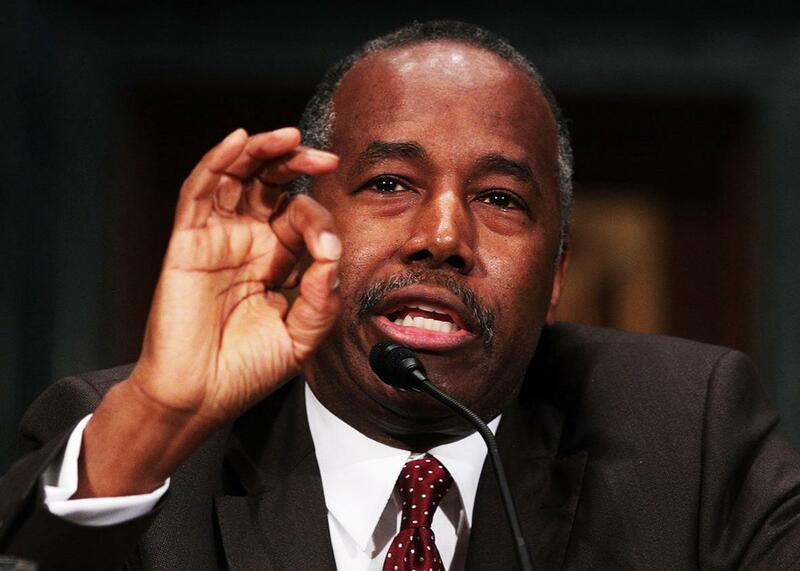 Ben Carson, future HUD secretary, knows nothing about HUD. His total lack of expertise about the issues HUD confronts was on full display at Thursday’s confirmation hearing. Ben Carson testifies during his confirmation hearing before the Senate Banking, Housing, and Urban Affairs Committee on Thursday on Capitol Hill. Carson still isn’t qualified. He has little to no experience with, or serious knowledge of, the issues HUD confronts, from home financing and affordable housing to efforts at racial and economic diversity in communities that receive federal funding. But his profound inexperience didn’t stop him from having a smooth confirmation hearing on Thursday, when he was questioned for several hours by the Senate Committee on Banking, Housing, and Urban Affairs. Tillis: When you go into Housing and Urban Development, can I get your guarantee that you will look at every program and determine which ones are actually providing the benefit to that next Ben Carson who may come up with his mom and be a neurosurgeon? And eliminate every single obstacle in the way? Carson: You can absolutely get my guarantee on that. Tillis: Do you think there are any sacred cows in HUD that stand in the way of that outcome? Carson: I’ve been studying it carefully and I haven’t seen one yet. The strongest questioning came from Democrats concerned that Carson would cut critical programs. “You said we don’t want people vegetating in public housing. Those comments were concerning to me,” remarked freshman Nevada Sen. Catherine Cortez Masto. New Jersey Sen. Bob Menendez asked if Carson “truly believes in the mission of HUD,” while Ohio Sen. Sherrod Brown pressed him on his view of HUD’s obligation to affirmatively further fair and integrated housing, which Carson objected to in a 2015 op-ed. “These government-engineered attempts to legislate racial equality create consequences that often make matters worse,” wrote the then–presidential candidate. At the hearing, Carson was less resolute. If there was anything like a contentious exchange, it was between Carson and Massachusetts Sen. Elizabeth Warren, who pressed the HUD nominee to promise that the agency’s budget not would financially benefit Trump or his businesses. Carson promised to “not play favorites,” but wouldn’t rule it out. “I will manage things that benefit the American people,” he said, adding that he wouldn’t object to funds going to the Trump Organization if it happened in the context of a move to help low-income Americans. Housing and Urban Development has a budget of more than $50 billion. It deals with issues that affect millions of Americans in often intimate ways. It wields immense influence over the physical landscape of the country, from cities and suburbs to exurbs and rural hamlets. If he’s to run a functional agency, Carson needs to have actual knowledge and expertise. What that looks like is flexible. Jack Kemp, who served under President George H.W. Bush, brought legislative experience and a serious interest in alleviating urban poverty; Andrew Cuomo, who served under President Bill Clinton, had experience in city government and then the department itself, having previously served as assistant secretary for Community Planning and Development. And there’s a long line of HUD secretaries—like Julian Castro under President Obama and Mel Martinez under President George W. Bush—who came to office having served as mayors of major metropolitan areas. Either way, they knew something; they had a sense of the issues at stake. This isn’t about ideology. It’s about taking the position, and the department, seriously. It’s not enough for Carson to be in the “people business.” Unfortunately, the U.S. Senate doesn’t seem to agree.